Out in the wilderness, small game will be the proverbial bread and butter of your survival. We'll ease you into it with a nice squirrel stew instead of the rat burgers we had planned. 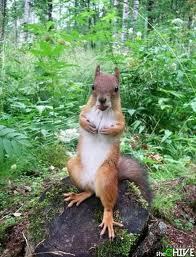 The good thing about squirrels is that they breed like their distant rabbit cousins so there should be an ample supply. Another good thing to note is that tree and ground squirrels both are active year round, although it becomes considerably harder to find them in their nests during the winter months. Squirrels are pretty easy to hunt considering they may be captured with snares or traps in addition to using small firearms. For today's recipe, and without further adieu, we proudly present our stew.